A leucine zipper, aka leucine scissors, is a common three-dimensional structural motif in proteins. They were first described by Landschulz and collaborators in 1988  when they found that an enhancer binding protein had a very characteristic 30-amino acid segment and the display of these amino acid sequences on an idealized alpha helix revealed a periodic repetition of leucine residues at every seventh position over a distance covering eight helical turns. The polypeptide segments containing these periodic arrays of leucine residues were proposed to exist in an alpha-helical conformation and the leucine side chains from one alpha helix interdigitate with those from the alpha helix of a second polypeptide, facilitating dimerization. Leucine zippers are a dimerization domain of the bZIP (Basic-region leucine zipper) class of eukaryotic transcription factors. The bZIP domain is 60 to 80 amino acids in length with a highly conserved DNA binding basic region and a more diversified leucine zipper dimerization region. The leucine zipper is a common three-dimensional structural motif in proteins and it has that name because leucines occur every seven amino acids in the dimerization domain. The localization of the leucines are critical for the DNA binding to the proteins. Leucine zippers are present in both eukaryotic and prokaryotic regulatory proteins, but are mainly a feature of eukaryotes. They can also be annotated simply as ZIPs, and ZIP-like motifs have been found in proteins other than transcription factors and are thought to be one of the general protein modules for protein–protein interactions. The mechanism of transcriptional regulation by bZIP proteins has been studied in detail. Most bZIP proteins show high binding affinity for the ACGT motifs, which include CACGTG (G box), GACGTC (C box), TACGTA (A box), AACGTT (T box), and a GCN4 motif, namely TGA(G/C)TCA. A small number of bZIP factors such as OsOBF1 can also recognize palindromic sequences. However, the others, including LIP19, OsZIP-2a, and OsZIP-2b, do not bind to DNA sequences. Instead, these bZIP proteins form heterodimers with other bZIPs to regulate transcriptional activities. Leucine zipper is created by the dimerization of two specific alpha helix monomers bound to DNA. The bZIP interacts with the DNA via its N-terminal, where the lysines and arginines are located; these basic residues interact in the major groove of the DNA, forming sequence-specific interactions. The leucine zipper is located in the C-terminal region of the bZIP and it forms an amphipathic alpha helix. When that alpha helix dimerizes, the zipper is formed. The hydrophobic side of the helix forms a dimer with itself or another similar helix, burying the non-polar amino acids away from the solvent. The hydrophilic side of the helix interacts with the water in the solvent. Leucine zipper domains are considered a subtype of coiled coils, which are built by two or more alpha helices that are wound around each other to form a supercoil. Coiled coils contain 3- and 4-residue repeats whose hydrophobicity pattern and residue composition is compatible with the structure of amphipathic alpha-helices. The alternating three- and four-residue sequence elements constitute heptad repeats in which the amino acids are designated from a’ to g’, whereas residues in positions a and d are generally hydrophobic and form a zigzag pattern of knobs and holes that interlock with a similar pattern on another strand to form a tight-fitting hydrophobic core. In the case of leucine zippers, leucines are predominant at the d position of the heptad repeat. These residues pack against each other every second turn of the alpha-helices, and the hydrophobic region between two helices is completed by residues at the a positions, which are also frequently hydrophobic. They are referred to as coiled coils unless they are proven to be important for protein function. If that is the case, then they are annotated in the “domain” subsection, which would be the bZIP domain. Leucine zipper regulatory proteins include c-fos and c-jun (the AP1 transcription factor), important regulators of normal development, as well as myc family members including myc, max, and mdx1. If they are overproduced or mutated in a vital area, they may generate cancer. ↑ David M. Glick (1997). Glossary of Biochemistry and Molecular Biology. Portland Press. ISBN 978-1-85578-088-0. "hair cutting scissors"
1 2 Landschulz, W. H.; Johnson, P. F.; McKnight, S. L. (1988). "The leucine zipper: A hypothetical structure common to a new class of DNA binding proteins". Science. 240 (4860): 1759–64. doi:10.1126/science.3289117. PMID 3289117. ↑ Vinson, C. R.; Sigler, P. B.; McKnight, S. L. (1989). 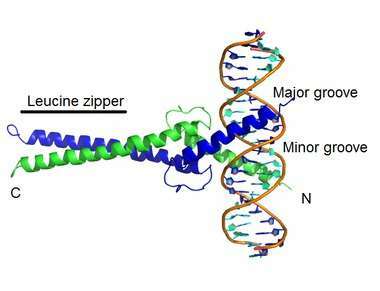 "Scissors-grip model for DNA recognition by a family of leucine zipper proteins". Science. 246 (4932): 911–6. doi:10.1126/science.2683088. PMID 2683088. 1 2 e, Z. G.; Zhang, Y. P.; Zhou, J. H.; Wang, L (2014). "Mini review roles of the bZIP gene family in rice". Genetics and Molecular Research. 13 (2): 3025–36. doi:10.4238/2014.April.16.11. PMID 24782137. ↑ Hakoshima, T. (2005). "Leucine Zippers". Encyclopedia of Life Sciences. doi:10.1038/npg.els.0005049. ISBN 0470016175. ↑ Nijhawan, A; Jain, M; Tyagi, A. K.; Khurana, J. P. (2008). "Genomic survey and gene expression analysis of the basic leucine zipper transcription factor family in rice". Plant Physiology. 146 (2): 333–50. doi:10.1104/pp.107.112821. PMC 2245831 . PMID 18065552. 1 2 Shimizu, H; Sato, K; Berberich, T; Miyazaki, A; Ozaki, R; Imai, R; Kusano, T (2005). "LIP19, a basic region leucine zipper protein, is a Fos-like molecular switch in the cold signaling of rice plants". Plant and Cell Physiology. 46 (10): 1623–34. doi:10.1093/pcp/pci178. PMID 16051676. ↑ Nantel, A; Quatrano, R. S. (1996). "Characterization of three rice basic/leucine zipper factors, including two inhibitors of EmBP-1 DNA binding activity". The Journal of Biological Chemistry. 271 (49): 31296–305. doi:10.1074/jbc.271.49.31296. PMID 8940135. ↑ Krylov, D.; Vinson, C. R. (2001). "Leucine Zipper". Encyclopedia of Life Sciences. doi:10.1038/npg.els.0003001. ISBN 0470016175.